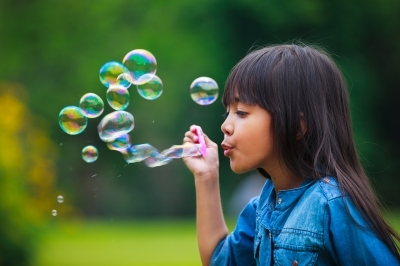 When bubbles of childhood joy replace sorrow and pain, there’s more room for simple pleasures in life. I walked to school to get my boys at the end of a busy day, and in front of me a young girl skipped down the sidewalk. Then she returned close to her Daddy’s side, never going too far ahead. First she squeezed her Daddy’s hand, then she looked at him, tall above, and decided she couldn’t give up holding his hand. Yet, I could see her dancing a bit, and perhaps she wanted to skip once more. Dad wasn’t into skipping so she just took smaller steps, bouncing up and down while beaming a large smile up to her father. I loved her determination to keep the joy she was feeling, yet remain close to her Dad. It whispered to the young one somewhere deep inside of me, coaxing a smile to my lips and a joy-bubble to my heart. Remember to smile and have fun, it seemed to whisper. Then I encountered the busy mayhem of elementary school pick-up time. Perhaps you do it every day, or recall a season when hallway jostling gave way to brief tag games with boys darting in and out of doorways, and you were “base.” Happy parent conversations perked along while you walked, and streamers from some class party littered the floors with happy colors yet to be swept into order. The day’s art project was shoved into your hands, which suddenly spilled over with a mélange of homework papers and vivid colors. Invisible glitter of children’s laughter and excitement to tell you about the day fills the air with a great flutter. It’s almost too much sometimes, until you remember this day was precious, too, and this age will slip by much too quickly. Then each paper and craft crammed in your fist became a treasure. Each messy hug after school, a gem. Each update about this and that, a pleasure. The bubble of joy once more pulled to the surface. Tension eased. Cares float to the backdrop instead of remaining center stage. Your heart settled, and it’s almost like butterflies can finally alight. Discovery and awe replaced the mundane. Colors and scents seemed stronger somehow. And it was very good. What little bubbles of joy are you looking forward to this week? ” Invisible glitter of children’s laughter and excitement to tell you about the day fills the air with a great flutter.” I love this image. Such a sweet picture. Thank you for sharing. You’re welcome, Patty! I love those moments! Dedicating this to a good friend … you know who you are. And for all those who are overwhelmed with Life … look forward to a bubble or two. So glad it was helpful! Sometimes we all need a little boost!